Valery is an ABO certified optician and contact lens specialist. She joined Woodbridge Optometry in 2007 with over 16 years of optical experience. 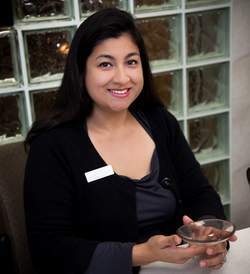 Valery has served Irvine area patients in a variety of roles during her more than 10 years with the Woodbridge family. Valery has children and is married to husband Victor, who is also an ABO certified optician. Julie has been a part of Woodbridge Optometry since 1992. With her always sunny disposition she is our official welcoming wagon. Julie is usually the first person to greet you on the phone or in the office. 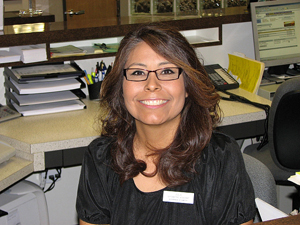 She manages our front desk and keeps the office running smoothly. Julie sets up patient appointments, orders contact lenses, pretests patients and administers insurance claims. Julie will be more than happy to answer any questions you may have about our office or procedures. Julie is a mother of two children and resides in Cypress. 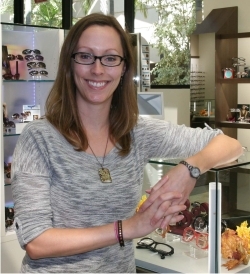 Rebecca began her career in the optical industry in January 1999 in the great state of Alaska. The following year, she and her husband moved south to California, where they’ve been right at home ever since. With an enthusiastic outlook on life, she enjoys adventures in the mountains all year round, hiking and snowboarding, and jogging with her pup Miner by her side. Rebecca’s enthusiasm also shows through her continued passion and dedication to her trade and through her enjoyment of working with patients. With her knowledge of technology and fashion, she is here to help you find the best solution for your eyewear needs.